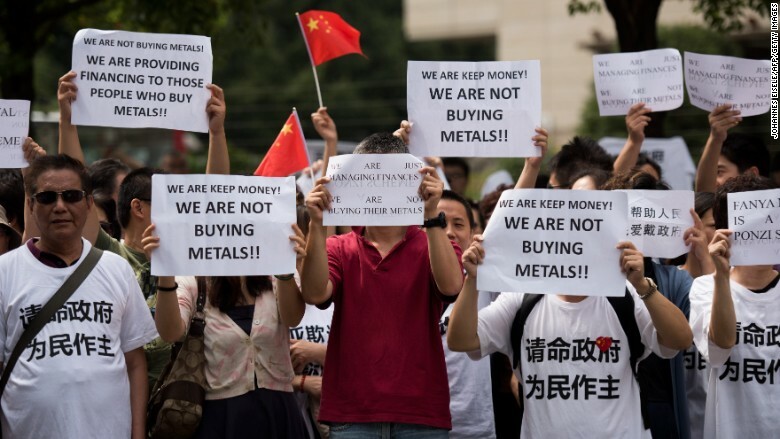 Angry investors in Fanya Metals Exchange protesting in Shanghai in September. A top Chinese executive embroiled in a giant investment scandal has gone missing. Shan Jiuliang, the chairman of Hong Kong-listed Imagi International Holdings, was last spotted at a board meeting on Oct. 15. He hasn't attended any meetings since, and the company "has not received any notifications from Mr. Shan or any government authorities about his whereabouts," according to a stock exchange filing. Shan is at the center of an ongoing investment scandal at Fanya Metals Exchange, a trading platform he founded in 2010. The exchange dabbled in metals commonly used in electronics, from silver to tungsten, and offered investment products. At its peak, the exchange was handling around 43 billion yuan ($6.6 billion) in assets for over 200,000 investors. In July, at least 27 billion yuan ($4.2 billion) in investments were frozen by Fanya. Investors also stopped receiving payments from a financial product the exchange said would provide annual returns of 13.7%, according to state media. When the exchange collapsed -- which happened around the same time Chinese stock markets crashed this summer -- cheated investors organized a number of protests, clamoring for their money back. Even before this year's bizarre set of events, government regulators were scrutinizing the exchange. Shan is one of numerous business executives that have gone missing lately in China. Few details are available, but many of those detained are being investigated for insider trading as part of a wider anti-corruption probe. Government authorities have been quick to assign blame for the summer stocks crash, arresting and accusing finance executives, journalists and others of rumor-mongering and falsely engineering a bull market. The Fanya exchange website is currently down, and the company could not be reached for comment.